The air suspension comes with 6 settings from a squatted 6” off the ground for easy entry to as much as 9 ½” of lift in Off Road 2 mode with water fording capability of up to 19”. When on road, Maserati’s Skyhook continuously adaptive dampers can be forced into a firmer sport setting at the press of a button for the most dynamic handling characteristics and work in conjunction with the Q4 all-wheel drive system which can move as much as 50% of the available power to the front tires while incorporating wheel-specific torque vectoring and a real, mechanical limited slip differential to maximize grip and driver confidence. And though these optional 21” staggered width Pirelli Scorpions are massive, the Levante S has often come unglued on these heavily salted, cold, winter roads. It feels strangely tail heavy which can be enjoyable and/or a little scary. When you want to back things off, the smartest drive mode choice is I.C.E. which stands for increased control and efficiency restraining the turbo boost and smoothing out the accelerator mapping…perfect for low grip conditions. Owners would be wise however to invest in a set of Scorpion winter tires for no less than $1,500. The Levante delights the senses with Ferrari-born engine sounds and a Sport exhaust that lets it all hang out. It’s well-mannered and easy going in its default settings and firm and energetic in its sport settings Just as you’d expect in a $100,000 SUV. But the dirty little secret about exotics is that they often lack some of the modern accoutrements you’d expect. At this price I’d like a heated steering wheel, heated rear seats and interior ambient lighting. I also wouldn’t mind a more up to date version of Chrysler’s UConnect system and some softer seats. 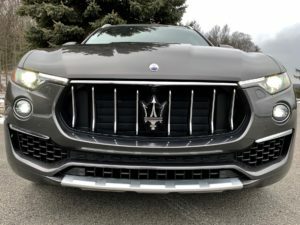 The GranLusso emphasizes style and luxury appointments so fittingly the cabin is very quiet, the optional 15-speaker Bowers & Wilkins Ultra Premium Audio system is $2,000 an audiophile will eagerly spend and the red leather interior with silk accents is oh so Italian delectable. The optional Driver Assistance Pack is highlighted by the Highway Assist System which works in tandem with the Adaptive Cruise Control with Stop & Go to keep the Levante centered in its lane…but it only works on federal highways. There is traffic sign recognition and a 360 degree surround view camera, but it needs an easy access button outside of the touchscreen. Its SUV credentials are OK…ample rear seats, at least for 2, with recline, 4-zone climate control and 2 USB charge ports, a motion activated liftgate and a wide, flat load floor with underfloor storage and elastic straps to hold things tight. But there is no mechanism for lowering the rear seats from back here. And in typical exotic car fashion, the power liftgate only worked about half the time. Towing is maxed at about 6,000 pounds. The Levante plug-in hybrid goes on sale later this year but if it’s this one that interests you just realize you’re trading in some modern luxury and convenience for the snazzy trident grille and a Ferrari soul.